Penny-pinchers, rejoice. A little money goes a long way toward having fun in Tucson — from art and history to science and outdoor adventures. Frugal visitors can enjoy a host of fun and educational activities in the Old Pueblo for about $10 per person or less. Even if you're on a tight budget, you can get out and take in some of Tucson’s most valuable offerings at little or no cost. Here are the highlights. Over the past few decades, the art of photography has found a home in Tucson, at the University of Arizona’s Center for Creative Photography. The Center was created in 1975 with the help of famed photographer Ansel Adams, and today houses the archives of more than 50 renowned 20th-century artists, the likes of Adams, Edward Weston, Richard Avedon, and Lola Alvarez Bravo. The center also boasts a Polaroid Library (with more than 26,000 volumes on the history of photography), as well as more than 100 periodicals, rare books and personal book collections of photographers, such as W.
This church is also called “The White Dove of the Desert.” Located nine miles south of Tucson in the Santa Cruz Valley on the Tohono O’odham Reservation, the “Mission” is acclaimed as the finest example of mission architecture in the United States. San Xavier was built by the famed Jesuit missionary and explorer Father Eusebio Francisco Kino, who first visited Bac — “place where the water appears” — in 1692. The foundation for the first Bac church, located two miles north of the present Mission, was laid in 1700. The present church, an active parish, was built from 1783-1797, and is currently open every day of the year, from 7 a.m. to 5 p.m. Located on the University of Arizona campus, the University of Arizona Museum of Art is home to a remarkable collection of Renaissance as well as 19th- to 20th-century art, including works of such giants as Rembrandt, Rodin, Georgia O'Keefe, Rothko, and Hopper. Apart from the permanent 15th-century exhibit upstairs, there are changing exhibits around prominent artists and themes. Free admission for students with ID, faculty, and staff, military personnel, visitors with a tribal ID, children and more. For others, it’s still inexpensive. Established in 1893, Arizona State Museum is the largest and oldest anthropology museum in the Southwestern United States. Located on the University of Arizona’s midtown Tucson campus, the Smithsonian Institution-affiliated museum is home to the largest Southwest Indian pottery collection in the world. The museum features more than 3 million objects, including 300,000 cataloged archaeological artifacts, photo negatives, original proofs, ethnographic artifacts and 90,000 rare books. The museum highlights the artifacts and histories of the Mogollon, O’odham, and Hohokam Indian cultures and possesses one of the country’s best Navajo textile collections. Free admission for children up to age 17, students with ID, researchers and scholars and more. Otherwise, admission is inexpensive. The transcontinental railroad, western heroes and outlaws, 1940s gangsters and Presidents and European royalty have all played a role in the history of Tucson’s downtown Railroad Depot. The Historic Depot on Toole has been a centerpiece of downtown Tucson for more than a century. Also known as the Turquoise Trail, the Presidio Trail is a historical walking tour of downtown Tucson. The tour, designed as a loop around downtown’s historic sites, is roughly 2.5 miles long and lasts between 90 minutes and two hours. The trail itself follows a turquoise-colored line that winds around downtown, past more than 20 restaurants. The tour includes 23 points of interest and nine optional sites to visit, such as the 1850s Sosa-Carillo-Frémont House; the historic Fox Theater; and the old Railroad Depot. Walkers will visit an archaeological dig for remnants of the original adobe-walled city that was the Spanish Presidio of Tucson in the late 1700s; an outdoor shrine for lost lovers; and at a café in the 1920-era hotel where Tucson police captured the infamous John Dillinger gang. A brochure and map are free from the Tucson Convention and Visitors Bureau. The tour begins at the all-new Presidio San Augustin del Tucson in downtown Tucson and coils through the city from there. Hikers and birders can head to the luxurious foothills north of downtown Tucson for a challenging trek on the Pontatoc Ridge and Finger Rock trails, which also wind around the Santa Catalinas. The shorter, out-and-back Pontatoc trail is a four-mile round trip, taking hikers up 1,000 strenuous feet in elevation and over craggy desert rocks on the path to the top. The longer Finger Rock trail takes hikers on a difficult, steep 10-mile trek to the summit of Mount Kimball. The six-to-seven-hour trek takes visitors from the cacti and palo verde trees of the Tucson Basin, up to the cooler pines of Mount Kimball. These activities cost less than or around $10. The DeGrazia Gallery in the Sun is a 10-acre retreat featuring a gallery of art, a “mission” and the artist’s home. The artist, Ted DeGrazia, is well-known for his impressionistic paintings of the Southwest’s native people. The buildings are works of art that DeGrazia built with the help of his Native American friends. Constructed of adobe, they feature walls and ceilings painted by his hand in the hues of the desert and a unique cholla cactus walkway. The textures and colors serve as a backdrop for DeGrazia’s artwork: paintings, lithographs, serigraphs, watercolors, ceramics, and bronzes. The H.H. Franklin Museum is a tribute to the Franklin automobile, which was manufactured in Syracuse, NY, from 1902 to 1934. The historic cars — which were known for being air-cooled, rather than water-cooled — were considered more technologically advanced than competitors. Though the cars sold well, Herbert H. Franklin’s company did not survive the Great Depression and declared bankruptcy in 1934. The Franklin Museum in Tucson features a number of classic Franklins, including a 1904 Model A 2 Pass and a 1918 Series 9B Touring Franklin. The museum, which was founded by longtime Tucson resident Thomas Hubbard, also includes an extensive collection of Franklin Company research materials. Founded in 1864, the Arizona Historical Society’s Tucson museum houses the world’s largest collection of historic Arizona artifacts, photos, and documents. The museum has conserved more than a half-million relics and features both interactive and traditional exhibits on Arizona’s mining, ranching, and urban histories. Children younger than 6, veterans and a few other groups get in for free, but for the general population, admission is cheap. The Fort Lowell Museum resides in the re-constructed 1873 commanding officer’s quarters of historic Fort Lowell, an Army post where more than 250 soldiers and officers once patrolled the U.S.- Mexico border and protected southern Arizona’s settlers and goods. The post was abandoned in 1891, after the end of the Apache Indian wars, and today houses informative exhibits on military life on the Arizona frontier. This unique, authentically western museum features 150 horse-drawn vehicles, from buggies to elaborate coaches. Guests can check out historic artifacts from pioneer days, re-created Tucson Main Street circa 1900. Tours last about an hour and a half. Since 1937, the Amerind Museum has told the story of the Americas’ first peoples, exploring the cultures of indigenous tribes from Alaska to South America, from the Ice Age to the present day. The Fulton-Hayden Memorial Gallery features the work of western artists Harrison Begay, Carl Oscar Borg, William Leigh, Frederic Remington, and Andy Tsihnahjinnie. Housed in Spanish colonial revival-style buildings designed by Tucson architect Merritt Starkweather, the Amerind Museum houses historical archaeological and ethnographic research collections, a research library and scholarly archives on Southwestern anthropology, archaeology, history, and Native American studies. The mission of The Tucson Museum of Art is to connect life and art; to inspire creativity and discovery, and to promote cultural understanding through art experiences. Established in 1924, the museum has housed both permanent and rotating collections by local and national artists. For current exhibits and more information, visit the museum online. The first Thursday of the month, admission is free from 5-8 p.m.
Nestled in the Santa Catalinas north of the city, Sabino Canyon offers a wide range of hiking adventures for beginners and experts alike. Outdoor adventurers can take on the rugged Seven Falls trail, a three-hour trek that crisscrosses over Sabino Creek and ends at the falls, which feature natural pools of water in which hikers can wade, swim, relax and rejuvenate before the hike back down. Less avid trekkers can take a relaxing stroll along the paved Sabino Canyon Trail or take a tram along the wide, scenic path for a cheap per-car fee. Serious hikers and bikers need to look no further than the 9,157-foot mountain overlooking Tucson from the north: Mount Lemmon. Experienced hikers can enjoy a variety of climates on the mountain, from desert lowlands hiking near the bottom, to cool treks through the Ponderosa pines at the top. The more difficult Butterfly Trail near the top of the mountain rises nearly 2,000 feet over 5.7 miles and is best enjoyed in summer and fall. Desert hiking enthusiasts can also enjoy the 2.6-mile Soldier Trail, which follows an old road and power line from the Catalina Highway to the site of an abandoned prison camp and offers spectacular desert views. For mountain bikers, the Santa Catalina mountains offer spectacular rides for experienced riders. With steep, technical trails — like the Crystal Spring trail near the top of the mountain or the lower-elevation Agua Caliente trail — Mount Lemmon’s trails are best suited for mountain bikers in search of a strenuous challenge. Adventurous road cyclists can take on the 25-mile Catalina Highway, which twists and turns from the desert floor to the top of the mountain, a two-plus hour, all-uphill excursion that takes riders up roughly 6,000 feet in elevation. The climb upward takes bikers from the warm desert climate to the high-elevation pines and 30-degree temperature drop atop the mountain. Though the trip up is slow, bikers can enjoy an all-downhill cruise back down the mountain, reaching speeds of 40 miles per hour in places. It’s an inexpensive per-car fee for trail use. The mission of MOCA is to provide a forum for the development and exchange of ideas about the contemporary art of our time. Through varied programs, MOCA supports the critical interpretation and display of the highest quality of contemporary art in service to the Tucson community. Admission is cheap for non-members. You can occasionally find free exhibitions. In the heart of downtown Tucson, the Sosa-Carrillo Fremont House is one of Tucson’s original adobe houses. First purchased by José Maria Sosa in 1860, the house was later owned by the Carrillo family for 80 years and leased at one point to territorial governor John C. Fremont. The restored house is furnished in 1880s period décor and features displays of territorial life in the Sonoran Deserts of Southern Arizona. Those in search of a trek through the classic, towering Saguaro cacti for which the Sonoran Desert is famous can set out on the many trails in Saguaro National Park in the Tucson Mountains just west of the city. In the park, take on the short, half-mile Signal Hill Trail — a perfect adventure for kids. The mostly flat, out-and-back trail leads to the Signal Hill Petroglyphs, ancient rock art created by the extinct Hohokam tribe. The trail takes hikers across a wash and up a hill of dark basalt rock, to the Signal Hill Overlook, where the thousand-year-old circular petroglyphs and other geometric rock art shapes are clearly visible on the hilltop stones. For the more adventurous hiker, the scenic, relatively flat 10-mile Cactus Forest Trail coils through the native cacti and succulents of the Sonoran Desert. 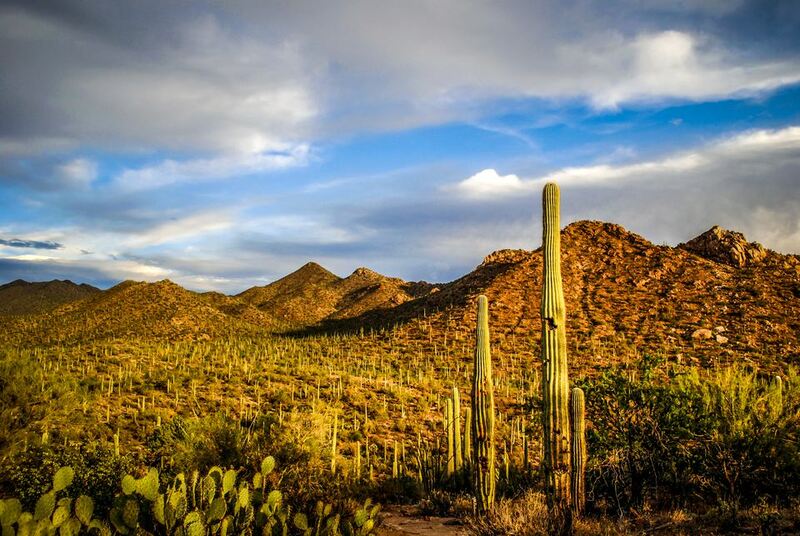 On the east side of Tucson, guests can hike through Saguaro National Park East on the Cactus Forest Loop Drive, an eight-mile, mostly paved trail that twists and turns through the Rincon Mountains. Hikers on the Cactus Forest Loop Drive can also head off-road on a 2.5-mile adventure on the Cactus Forest Trail, which twists through stands of the park’s namesake cacti. Translated from the Tohono O'odham language, Tohono Chul means "desert corner." This 49-acre desert preserve is a leading Southwest center of desert nature, arts, and culture — and is listed by National Geographic Traveler as one of the top 22 Secret Gardens in the United States and Canada. This oasis in the desert offers a respite from the hectic pace of daily life. It provides an informative look at the region's fascinating cultural traditions and its even more interesting flora and fauna. Visitors can enjoy a delicious breakfast, lunch or afternoon tea in The Tea Room, which is housed in a handsome Spanish-Colonial home or shop in the museum shops. Tucked away in the heart of midtown Tucson, the Tucson Botanical Gardens is a five-acre oasis of natural beauty, inspiration, and education about the natural desert. The Botanical Gardens feature 16 gardens with diverse themes, such as the herb garden, the xeriscape garden, the butterfly garden, the Backyard Bird Garden, the cactus and succulent garden and more. It’s located on the historic 1920s property of Tucson’s Porter family. Tucson’s zoo features more than 400 animals, from elephants and rhinos to lions and polar bears. With regions of the park devoted to South American, African and Asian animals, Reid Park Zoo allows adults and children alike to view and learn about a wide variety of exotic animals, such as jaguars, anteaters, gibbons, zebras, and giraffes. “The Flight Connection,” a full-flight, walk-through aviary, lets visitors explore the many different aspects of bird life. This nonprofit museum is southern Arizona’s interactive museum for kids, featuring 10 fascinating galleries of hands-on exhibits that allow children to participate in challenging activities. With fun exhibits, such as Dinosaur World, highlighted by four life-sized robotic-animated dinosaurs, and Fire Station, which lets kids wear firefighting gear and climb into a real fire truck, the Tucson Children’s Museum helps kids learn about nature, science, safety and more, all while having fun. The world’s largest collection of optical telescopes is found high in the Sonoran Desert at Kitt Peak, on the Tohono O’odham Reservation. It is home to 22 optical and two radio telescopes representing dozens of astronomical research institutions. The National Optical Astronomy Observatory, funded by the National Science Foundation, oversees site operations on Kitt Peak. Explore the Visitor Center exhibits and gift shop to learn about astronomy. Take a tour and discover how astronomers use telescopes to unlock the mysteries of the universe. Visit the National Solar Observatory exhibit gallery and watch scientists operate the world’s largest solar telescope. The University of Arizona Science Center brings together the university and local communities to inspire the teaching and learning of science, technology, environmental sustainability and more. Located on the university’s campus, this is the place to go for astronomy buffs of all ages. Attend Flandrau’s special planetarium shows and get your hands dirty with hands-on science exhibits. Explore the history of Earth at the mineral museum and catch a glimpse of the heavens at the Planetarium.